Time to start some video game awards! 2015 was a pretty great year for video games in a lot of ways. It seemed like a number of quality titles were released in just about every category and genre. So let’s get things started with a strong category, Best Multiplayer! When it comes to multiplayer gaming in 2015, there was really only one game I could have picked due to its originality and sheer fun. Splatoon is one of the most original games in years, and a wonderful addition to Nintendo’s peerless catalogue of franchises. A multiplayer shooter in which there’s no actual shooting. 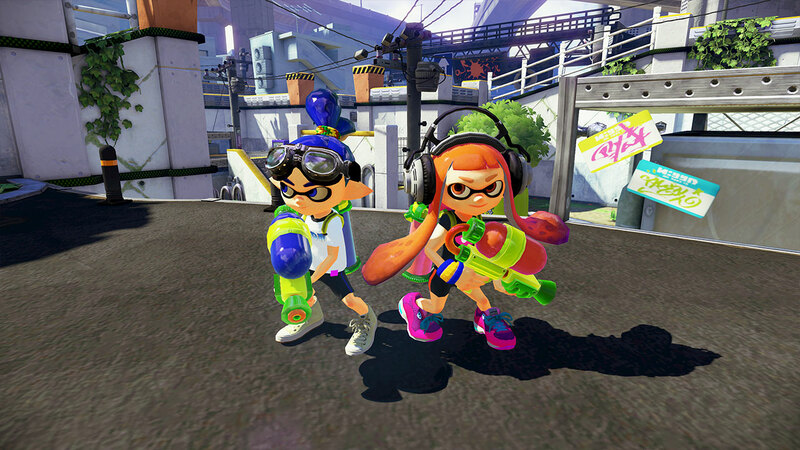 Splatoon is Nintendo’s reinvention of a genre that had seemingly run out of ideas. The concept of Splatoon is simple: You play as squid/kids who shoot colored ink from their guns. The team that covers most of the arena with their color is the winner. What Nintendo managed to pull off with that simple idea is astounding, and it’s only gotten better better through the game’s many updates. Splatoon is Nintendo’s newest IP, and it is quickly growing into one of the Big N’s standout franchises. And with good reason, it’s a stellar multiplayer experience through and through. I haven’t tried Splatoon yet, but I think I’ll pick it up eventually. A lot of people have been saying great things about it. Also, the concept of Rocket League reminds me of the soccer mini-game from Excitebike 64. It seems like it’s better fleshed out with this game, though. When you get a Wii U, definitely get Splatoon. It’s very fun and unique. Funny, our fellow blogger at Very Very Gaming made the same comparison with Rocket League. I never played Excitebike 64, so I can’t say. But if it at all inspired Rocket League it must be good. I wouldn’t be surprised; he mentioned that game in the past on my site. It’s an underrated game, in my opinion. It’s weird that it has yet to be released on the Virtual Console. I wonder what the deal about that is. I once thought it’s because the game has the original Excitebike included as a bonus, but they rereleased Donkey Kong 64, so that theory is out.